Pro-Ject Debut Carbon review | What Hi-Fi? The thing about being at the top is that everyone wants a piece of you. That’s certainly the case when it comes to the Pro-Ject Debut Carbon – Award-winner and our turntable of choice at this price. Now it’s being called to battle in order to prove its worth once again – does it still have what it takes? One thing is for sure. Pro-Ject is adept at making tempting turntables. We’ve always been big fans of the Debut range, but the Debut Carbon really is unusual because of its super-light, super-strong tonearm. It’s made of carbon fibre, a material usually reserved for far more exotic offerings with four-figure price tags. Yet here it is. Elsewhere, there’s a weighty metal platter, a felt mat, and the Ortofon 2M Red moving-magnet cartridge. It comes factory fitted to the fixed headshell, which makes set-up a lot quicker. You’re left with just the counter and bias weights to install, along with speed adjustment. This is simple enough, if a little fiddly. The counter weight is a standard-looking thing but the bias weight is old school, hanging off the back of the tonearm and looping through a small hook. It never feels like these parts are going to fall off, but it does feel precarious. Oh, and the tonearm rest doesn’t have a proper locking clip, so you really don’t want to knock this turntable. Speed change is manual: you’ll have to take off the platter and move the belt by hand to go from 33⅓ to 45rpm. The whole set-up process takes a matter of minutes, but you’ll want to pay extra attention to placement. Keep the deck perfectly level and well away from the speakers. The Debut doesn’t have any isolating suspension (unless you count a set of compliant feet) so make sure its support is as rigid and vibration-free as possible. 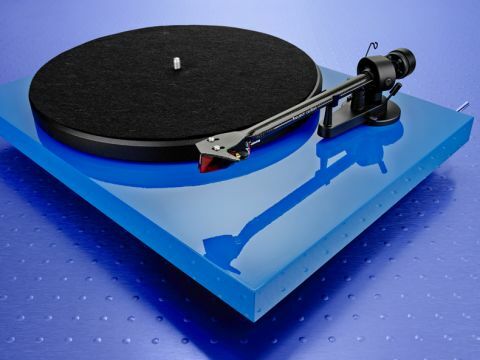 The turntable is well made, and is available in seven high-gloss colours. And – for the Henry Fords of this world – one of them is black. Time to jam, and it’s Closing Time for Tom Waits. The Pro-Ject is a fine-sounding package for the money. There’s a pleasing level of clarity. It’s a clean, insightful sound that digs deep to reveal all manner of texture and nuance in the mournful guitar fiddling. All the while, the deck keeps a firm grip on the musical structure, with a good level of rhythmic precision. That’s not to say the Pro-Ject’s performance is clinical: it’s expressive, clearly displaying a good deal of subtlety and fairly wide dynamics. If we had to nitpick about something, we’d say the Rega RP1 Performance Pack offers more power, and a greater sense of authority in the low end – but then again it doesn’t have the impressive clarity of the Pro-Ject, nor it’s amount of detail. Really, you can’t go wrong with the Pro-Ject Debut Carbon. It’s not the newest turntable around, and the competition may be tough, but even after a few years it has proved that it’s still among the class leaders at this price.